It's easy to forget when the day is long, the struggles seem endless, the pain won't go away or the pressure has you ready to explode. I know this, I experience it, and sometimes I succumb to my flesh, fall in a heap and cry or blow my top when there's nobody home to hear me. Doing for others, staying on top of things around the home or at work, living with relational stresses or trying to cope with an illness that restricts your day to day life - all of these can get on top of us and take away the peace we dearly crave, and may in turn breed discontent, anger, jealousy, depression or a 'what about me' mindset. "...as for the Lord and not for men" always catches me up because I forget it so quickly. When God trips me up with these verses every year or so I am duly reminded WHO I am doing everything for and it sure ain't for myself. When I'm giving, it's for Him. When I'm kind, it's for Him. When I hold my tongue, it's for Him. When I take responsibility for my own faults, it's for Him. When I go the extra mile, it's for Him. When I treat others the way I want to be treated, it's for Him. When I step back to let someone else go forward, it's for Him. When I choose not to gossip, it's for Him. When I work to help our family, it's for Him. When I cook to feed hungry tummies, it's for Him. When I wash the clothes, it's for Him. When I am prudent to stay within our budget, it's for Him. When I choose prayer and Bible time over a television show, it's for Him. When I choose to forgive, it's for Him. 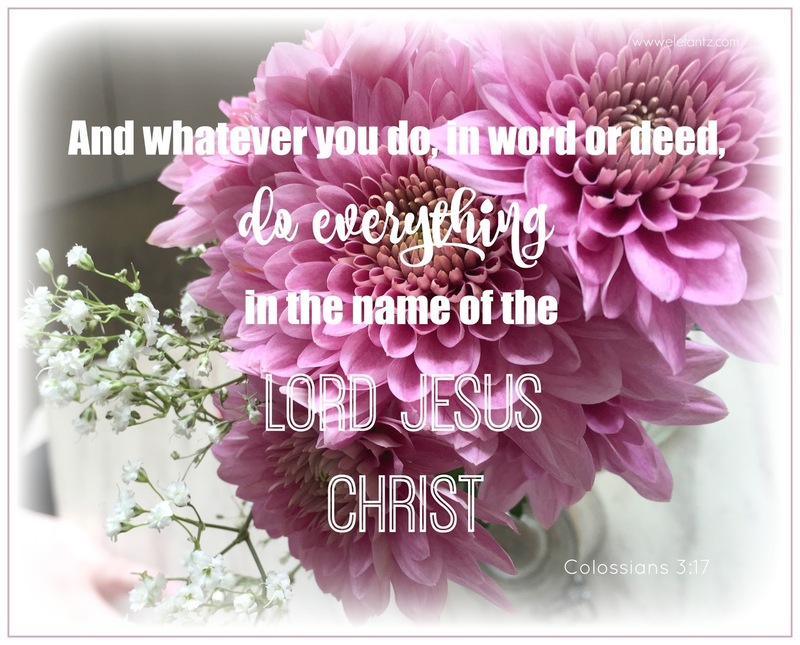 The list could be endless if I continued but I just want to express how wide and varied are the "whatever you do"s in Colossians 3:17 and how obeying this Scripture requires us to include every aspect of our lives until we meet the Lord face to face. It reminds me of the strict gluten free and dairy free regime I am on as a trial for the next few months. In order to enjoy this menu I have to replace what I am used to eating with ingredients that are better suited to my health challenges. It's not been easy, but the more I persevere, the more creative and tasty my recipes become. Two weeks in and my body is already feeling the improvement, plus I have more energy to do the things I used to enjoy but had become too exhausted to try. If I apply that same scenario to giving up my old selfish ways and replacing them with examples of how Jesus behaved, it will be my spirit which will feel the improvement, and the flow on from that will be a kinder, more considerate and calm Jenny. I think that's one of the best things about soaking in the Word every day; God speaks to us where we're at and loves us so much He wants to guide us onto a better path. I for one am very glad about that. Thank you for your wise words. Yesterday was an Alexander day in my family. I hope that my reference to the Alexander and the No Good etc Day is understood. I don't know how long the damage will last. But I will carry on praying for my most wayward child who seems to strike out at every little thing at present. I also understand the gluten free, lactose free and other things free regime. A dietitian put me on the FODMAP program due to my allergies. Now I have a new host of things I cannot eat. It has improved my life but my mother, who I care for, does not like the funny food. This is how she views lactose free milk. She knows I am allergic to the crustacean family, eggs and quite a few grains. When I was growing up if crab was for dinner I wasn't given an alternative. Now I am the cook and it is so darn difficult. I bought the Fodmapper magazine released by the gluten free people. I was so excited and then discovered I could only eat about 5 of the recipes in the book! I pray you find an easy way around your present difficulties. God bless. Sorry if there is too much information. Thank you for your continued encouragement feeding us with your broken pieces so we too can feed others. Truly you feed a multitude. God bless. Will be keeping you in my prayers. Jenny, I so love your gentle, healing demeanor in everything you do. Seeing "Jenny of Elefantz" in my inbox makes me take a big deep breath and smile. Your gift of encouragement is very special. Thank you sweet Jenny. Excellent parallel between the scripture benefit and the diet benefit! Thanks for today's post.